Every few months, we’ll be introducing you to a new School on Wheels staff member so you can learn more about the people who make our programs run successfully! 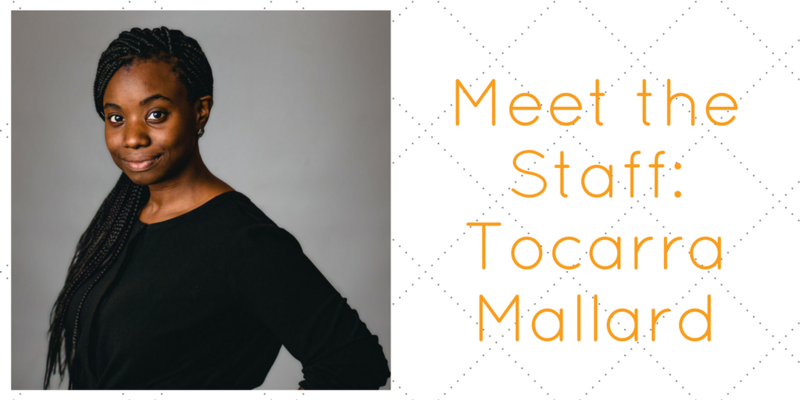 This month, we’re highlighting Tocarra Mallard, one of our Program Coordinators. What is your role at School on Wheels? I’m a Program Coordinator for Coburn Place. What did you do before you came to School on Wheels? Before working at School on Wheels, I was teaching design thinking to K-8 students in Chicago. Why did you decide to join the School on Wheels team? I loved my experience as the summer Art Assistant at the Salvation Army Barton Center, and I was looking for other ways to get involved with the organization. My favorite part about being a Program Coordinator is watching students have a good time learning. Can you share one of your favorite tutoring stories? There is a father/son duo of tutors who taught a School on Wheels student multiplication songs to help her with her facts. They are all very catchy tunes! I’m also a comic! I’ve been performing for almost three years. Thanks, Tocarra! Be sure to stay tuned to meet the rest of the staff in the coming months. Next Story#SharetheLoveIndy Results Are In!